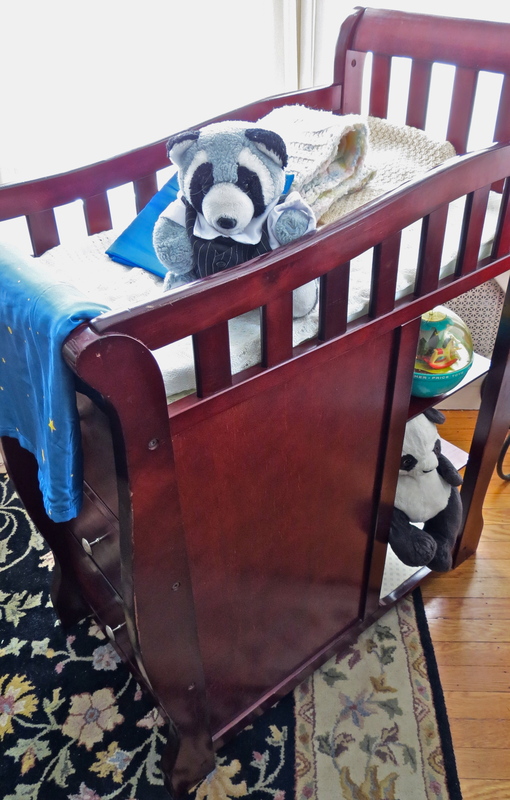 Outfitting a Nursery for under $30! Our first grandchild is due early August so our thoughts turn to assisting our daughter, MaeC, and son-in-law, Jared, in setting up the space for the new arrival. As a yard and thrift sale aficionado, its time to see what treasures are waiting out there. Thrift store shopping requires frequent stops, but it’s possible to hop in and out quickly when focused on what you want. Because baby things are only used for a short time, most people are happy to give away what they can no longer use, so usually there’s a good selection. After MaeC and I checked out two thrift stores with no success, our luck changed with our third stop, for right in front of us stood two changing tables, one standard, top platform and two shelves, and a second dressing table with drawers and shelves. The two pieces matched and had a rich cherry finish. However, both were dinged up and needed a good polishing. Knobs had fallen off the drawers. Still, at ten dollars each, we couldn’t pass up the deal. On our way home from the thrift store, we stopped by a hardware and picked up three knobs. 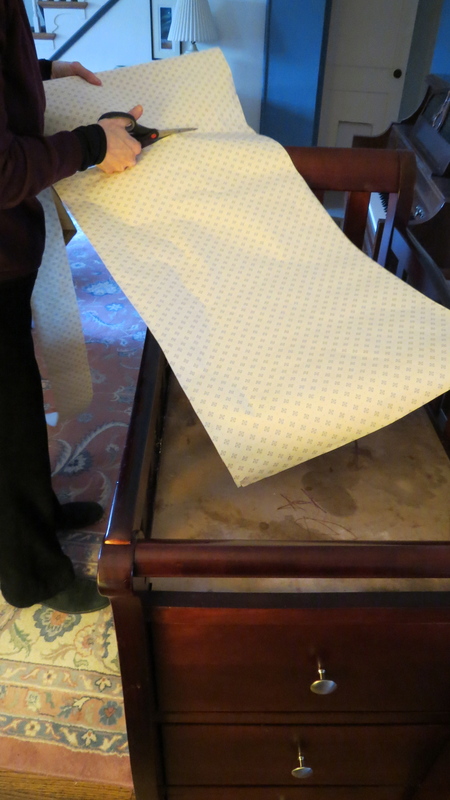 Once at home, we started the restorations, beginning with cleaning the pieces with furniture polish, and using a furniture marker, fixing the places where the finish had worn off. The marker worked especially well with the dark wood. 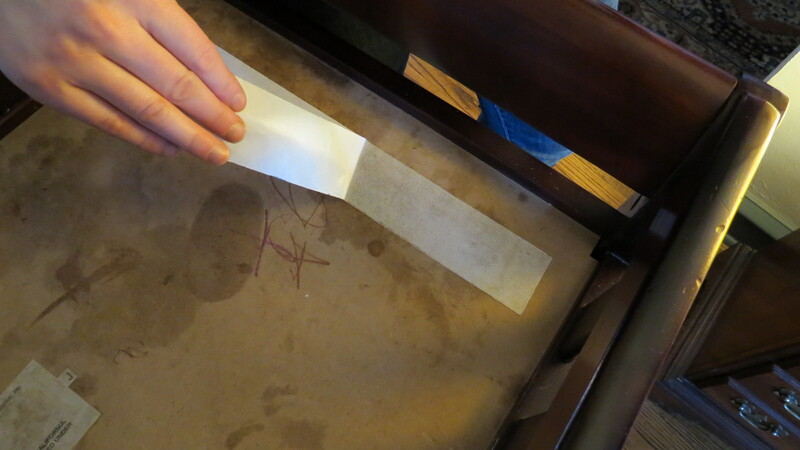 I’ve used these markers on furniture the cats attacked and even deep scratches disappear. 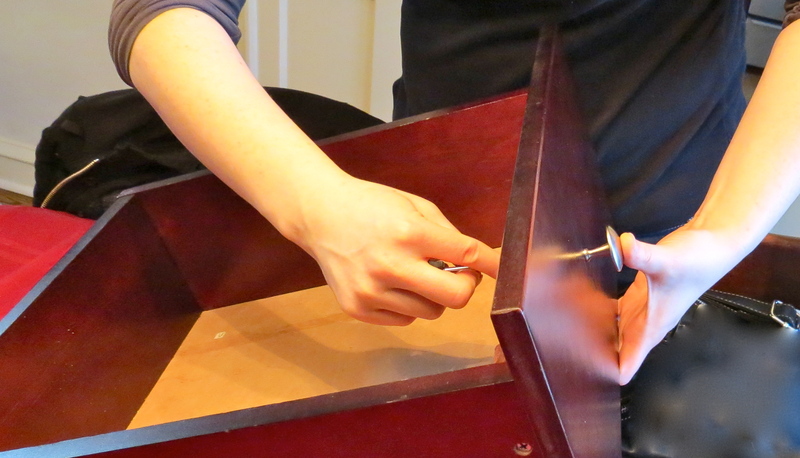 Next, we attached the knobs, which was an easy process of inserting the screw and turning the knob. 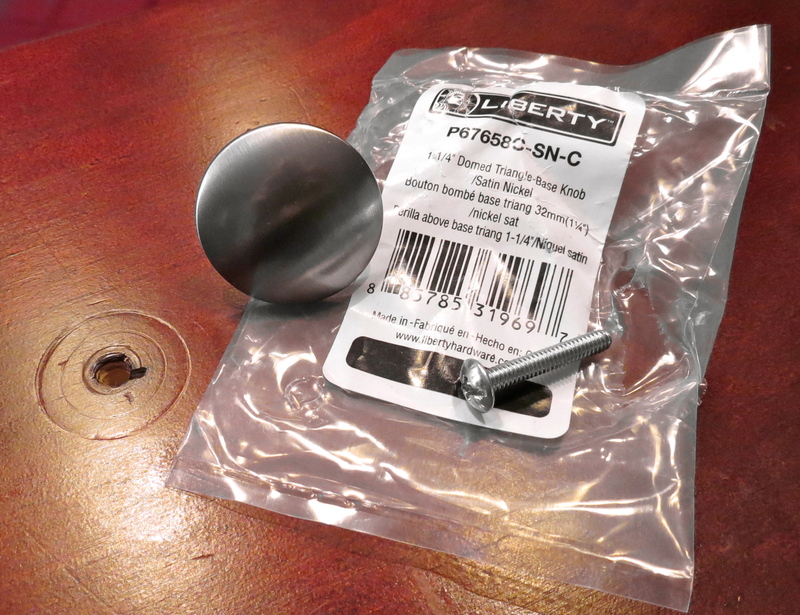 For some reason one knobs was still loose, but after adding a washer on the inside of the drawer, that adjustment made the knob fit tightly. The shelves, spotted and stained, gave the pieces a poor appearance. We had two choices: to paint the shelves or cover them. Since I had saved leftover wallpaper, we decided to cover the shelves. We went up to the attic to retrieve the rolls, selected two and then began measuring. Double-sided carpet tape worked great for affixing the paper to the shelves. In keeping with our recycle up, I returned to the attic to find the clothes and blankets I had saved from the children’s baby days. 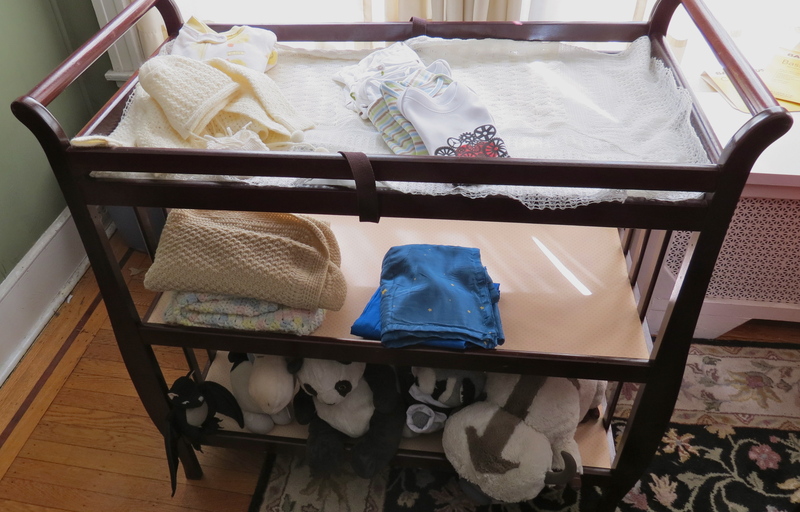 After washing them up and air drying, the baby items were ready for storage in the changing table. Jared’s mother, Gwen, sent along some new baby clothes. A little steampunk shirt rests alongside of the knit hat and sweater MaeC wore on her trip home from the hospital all those years ago. Gwen also sent two handmade blankets and stuffed animals from Jared’s childhood. MaeC and I had a great time fixing up these pieces and spending time together working on this project. Adding the finishing touches, all we need now is the baby!